Oski has got to be the coolest bear around. Nice SF Chronicle article on CAL day, but it sounds like the real hero is Oski, who braved the heat and worked the "room," that is CAL Berkeley. 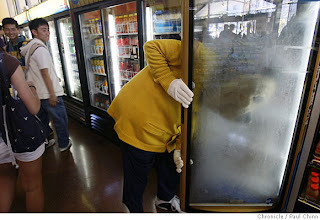 Here's a picture of Oski trying to cool down by sticking his head in a freezer.